I’m heading to Seattle next so definitely there. Back to seattle. Can never be too waterproof up there. I am going! Last day of February i’m travelling to Buenos Aires, for 3 weeks of research (doing my MA in History). The bag, I need it. Really. I have to take Laptop, Ipad (to keep in touch with my husband and the two gorgeous boys im leaving behind), camera (to fotocopy 1,000,000 documents) and yes, I will need to brush my teeth as well. I’d hit Japan ,for sure! From North to Southern Islands, oh boy that’d be fantastic. My wife and I are planning a trip to Ireland. This would come in handy. I’m headed off to Germany in January for an architecture school trip. These things would come in handy! New York! 2 reasons, As I have never been there before. And I would like to retrace the steps of my friend who lived there before she died. This bag would be a good friend to take along. Inspiration lies on the road to be traveled. Got to get back to Paris! Maybe for fashion week next Printemps/d’Éte. With gear like this I would love to spend Christmas on Orcas Island, WA in the Puget Sound. Stay in a waterfront cabin and enjoy all the beauty the Northwest has to offer. Hawaii in January for my 1st wedding anniversary and husband’s birthday! I’ll be going to NYC! Diving in Bonaire in January! I would travel uptown to my ex’s apartment, and give it to him. Because I’m pretty sure he still doesn’t have any personal hygiene products, his pockets burst at the seems because he puts so much in them, he always plays horrible euro-dance music so he needs those headphones, and yeah he’s been in the country for years but doesn’t use half of his stuff because he has no converters. He’s a mess, he needs this to get somewhere in life. My brother’s moving to Estonia so I will start there before meandering south. I’m looking toward Turkish tea, tuk tuks in India and Full Moon parties in Thailand. Not too shabby 2013! i’d take it to japan! I would start traveling in germany, hitting my fathers home country romania and from there on southwards to africa. Abisko National Park in Sweden, to see the stunning Northern Lights! Ah I might plan anther trip to east coast becos of these travel goodies. That travel plug will do all the tricks for the European trip as well. To high in the Rockies. I’m not telling were. It’s a secret. I’d bring it on a beer tour of Europe. So many good beers, so little time. I would go all around Korea, where I’m staying now, and then to China and back to the states in spring and summer. I am currently in Korea as an exchange student, so I would take this all around Korea, then over to Japan, then to China in the spring, then back to the states in June. Around the World!! Starting in New Zealand! Stopping off in Peru and Iceland at some point! Everywhere and anywhere! Before I leave this continent again, I’ll have a long winding travel throughout it. I’ld love to visit Japan. From Tokyo to Kyoto. Going between my two home bases, Vegas and Vancouver I always forget something, this will help me keep it all together! Dubai and then on to Melbourne, please. hiking/camping in NH and VT! Iceland! And jump on a mountain of squishy moss! Japan. Always wanted to see Tokyo. I’m going to work in eastern europe and I’d love to go to korea or go back to vietnam! Backpacking through SE Asia next year, would really love the gear! Going on a four month backpacking trip to SE Asia next year! So would definitely be bring all of these along for those long train/mini bus rides, and hiking off the grid days! I would use it taking my first family vacation, ever! My very first business trip to Vegas! I would take it to a beach somewhere in Mexico or Hawaii! I’m traveling to Kerala, India in February to do cultural and professional exchange through Rotary International. This set would be perfect for the month long adventure! This would be perfect for a return trip to Formentera, Spain…this time with both of our kids. I’ve been dying to go to Iceland, from partying in Reikjavik to exploring the glaciers and hot water springs, to petting all the ponies! I would go to Brighton to visit my little sister! I’d have to say Thailand or Bora Bora .. since it’s a long flight from Europe, I’ll need something to kill the time. If i won i would go to…. NYC!!!!! My dad recently passed away and my mom would make good use of these on a trip to Colorado some time next year. Pontypridd, South Wales with the woman of my dreams, plenty of bits and bobs to keep us amused in the snow and welshliness. This package looks so refreshing, I think I’d have to go somewhere bright and tropical! It may be domestic, but I’m ashamed to say I’ve still never been to Hawaii! Al-Sorat Farm south of Cairo. Talking Heads on the earphones as we ride out for Giza on horseback: backpack with snacks including a cold vinho verde and icepack snuggled up in that notebook compartment. Hideo tarp can take a splash from the Nile, and I’d keep some silky things inside the Baggu to make a pillow to recline upon as some lovely young man fans me and feeds me a date. Field Notes to document everything that happens afterward, for something scandalous to read on the train…. All the way to Ice Hotel, Sweden! Later guys! I’m off to New York! To South Africa. To make wine. Headphones a cellar sanity necessity. Notebooks for writing down winemakers’ secrets and bringing them home to Canada. Toothbrush for preserving what precious enamel I have left. Backpacks for daytrips, to escape the cellars and see the South African sunlight. Luggage for bringing gifts from and for home. Or, a ride on the Trans-Siberian railway, Moscow to Vladivostok. Either way : : adventure. I’d take this bundle on my graduation trip to visit my sister in Ecuador. I’m planning on going to China!! Going back to Europe, traveling east Asia, visiting family in South America, or even just a humble camping trip in one of these little towns here outside of New Orleans… these would see a lot of use. I’d be set for anywhere and everywhere! I’m not sure where I’ll go. Maybe this will give me the motivation to just drive to the airport and just pick a place that I’ve never been. I would take this to the Sunshine Coast of Australia on my quest to trace my families roots! Backpack trip across South East Asia! I would by the cheapest last minute flight to where ever, with the Hideo tarp luggage and Qwstion washed grey backpack I could pack for whatever adventure lies ahead. With the flat pack universal travel plug, it doesn’t matter, Europe or Asia, or anywhere, I would be fine to charge my phone while I listen to travel guides on my new Aiaiai track headphones. I can keep my Ohso travel toothbrush and acessories in my Baggu packing aid. All the while writing about my adventures in my Field Notes notebooks. Singapore - because I miss Grandma. Hong Kong - to see friends. China - to learn Mandarin so my Chinese half stop calling me angmoh. Korea - because I find Korean easier than Chinese so I’m going to learn that instead! And I’d take pictures and you’d be all like - “who keeps sending me these pictures of backpacks in lame locations?” And I’d be all like - “Look at these pebbles!”. I would take it to Finland. I have always wanted to show up in style to the coolest place on earth. I’m really wishing for a trip to Spain! I would be straight off to south america to meet my brother that’s traveling there! I hope to get to Costa Rica soon! This package would be my gear fix as I head to the rugged mountains of Laos to work with the Hmong people and record their language and stories for future generations in an effort to preserve the richness of the dialect. Thanks for considering! If they arrived by the holidays I would take them to Costa Rica and thru the Panama Canal with me (and my 94 year old Grandmother). Cause that is where we are headed! I would love to take this pack with me and travel Europe, specifically Spain and Italy. i’m not sure where it’s going to be yet - but it will be my honeymoon! I would take my wife to Sweden (from the US) to visit her family. Backpacking South America is next on my list of adventures. Although I’ll always have a soft spot South East Asia! Not sure where yet, but it would be my honeymoon next year!!! To every corner of the world - i want to see everything possible! I would take it everywhere, you never know when you have to catch a quick nap or stay late for work. I travel often for work, so all over the US! For pleasure we are thinking about going to Germany for Oktoberfest next year. I would take this gear straight to Sweden and run around to as many uninhabited places and local coffee shops as possible, then I’d head home to get married this summer and take my now fiance to Ireland to fulfill her dream. This would be perfect as my wife and I are taking our dream vacation on the 25th of this month, so it would be good timing too. We have been saving for a long time and will be traveling to Australia for a week then head to New Zealand for another week and finally one week in Fiji!!! This backpack combo would be great as we will be doing a lot of moving around and will only be taking whats necessary. I would love to go back to the UK, it has been too long. Some place sunny and warm - Belize or Hawaii or somewhere with glorious weather. It would definitely be Ireland. I’ve been wanting to go to visit cousins and explore my Irish heritage. Especially the south of the island, even though my Wee-ma shipped out of Dublin to America. The only question would be do I just bring the wife, or do my four young daughters come along for a trip of their lifetime… who am I kidding, it’d be the whole family! After i’m done packing ill take off to Thailand to forget about the heavy snow. I would love to bring my girls up to the hill country to see all the changes in the leaves and the beautiful waterfalls and sceneries. From top to bottom through all the Japanese Isles! Sun and surf in Chile. Brazil!!! I’m going for the first time this spring. I agree with Anna and Tyler. As soon as I saw those field notes (and pack) the Amazon came to mind. Honestly though, right now anywhere warmer would be great! I would take this gear to the Ice Hotel. Hey, I just moved back from living in Europe for 3 years. I would go back to Tuscany, Castelnuovo Berardenga, camp out in a “borgo” which is right above the cloud line- called “montebenichi’. I would use the notebooks to write down the recipes I would learn from the old Italian women of the village. I would move from Borgo to Borgo, staying in what once were castles, now just rooms for rent. I moved back to the US to help my father in his fine dining restaurant, but he just fired me last week, because we got in an argument in front of the staff. Talk about bundling- business and family. This bundle seems a lot friendlier. I’d be Machu Picchu bound! I would first travel to Tel Aviv to visit a friend and see this amazing city. Then off to Jordan to see Ammen and finish off with the ancient city of Petra. African safari with my cousin and best friend (they just got engaged)! belize. conch on the beach. grilled. I think this would be perfect for an Iceland visit. I will take the bundle off to Japan for my honeymoon (yay!)! Because (obviously) the Battlestar Galactica crew landed on Earth and are in turn our ancestors, I would like to take this on my journey back to Caprica. I’d take off for a month-long dj tour as a break from teaching college students - hitting New York, Philly, Boston, Montreal, Halifax, Chicago, Detroit, and then back home to Brooklyn..
Go backpacking through SE Asia with these supplies! I would take off to LA! I would jet off to South Korea to introduce my young daughter to an integral part of her heritage. After reading the latest Nation Geographic, I would love to take this gear to Sequoias National Park to see those amazing trees. As an anthropology major, I’d use this for my travels when I travel to Ghana. The field notes notebook will be great to use for data! I’d take to the trains of Japan from the island north to south with companion in tow. So many sights to see! Where wouldn’t I travel? To college to studying abroad back to Europe and beyond… I’ll be testing out my Japanese in 日本 and my french in Vietnam, Tunisia, and Morocco. To infinity and beyond! I would take off to LA to see a bunch of old friends. After that, I’d take off to Niagara Falls! I would take these fabulous gifts with me to my girlfriends Christmas Party …I would be the Envy and Belle of the Ball. I would take these with me to London! I’ll probably head off to the countryside in South Korea. Just to listen to music and write. Traveling has always been one of my passions - 52 countries and counting - yet I’ve never had a specific destination in mind. I’m off to Afghanistan for the first time this summer for a public health internship and I’d love to tote all my gear in something this stylish! Heading off to see the Aurora Borealis in Iceland, of course! I’m going to London in the summer, I need all of these things! With this gear a round the world trip is in order! This couldn’t be more perfect! I just returned from a trip to Ireland and France and I really could have done with some backpacker light gear. If I win this I would book my adventure to South America and see how far I could get before the money runs out. Seriously guys, this would be amazing. I’d stuff it all with my most important items, and head off to Asia to reconnect with the most important people in my life! Without a doubt I would go to JAPAN! It’s on top of my travel list, I love the contrast between the hitech and the spiritual. I need this for my Italy trips! I’d love to go visit my friend in Prague! YES! TAKE ME ANYWHERE BUT HERE! Still would like to go down and visit my watch collecting buddies in NYC! my photography backpacking trip across europe including a visit to chernobyl which i’ve wanted to do for 5 years! I want to get my Eurorail pass and just go anywhere I want in Europe, with just the basics and a smartphone for emergencies to just disappear from my regular life for a few months or more…starting with Italy again! I would like to travel to Bhutan and study the culture there, especially the architecture and the regional Buddhism that has developed in such a remote place. Californ-i-a!!!!!!!! :D Spring Break 2013 whooooo! I’d take a trip visiting family and stuffing my face in SF, Taiwan, Tokyo and Hong Kong. I’d love to go to south Italy. any where! japan? china? italy? france? we’re 3 years behind on vacationing so any where would be wonderful. I’ve always wanted to travel through the Northwest Territories of Canada, and over to Greenland. Also New Zealand, as when I was a kid my father’s friend came to stay with us and since then I have really wanted to backpack along the Island. would be lovely to go to Lantern Festival at Taiwan this 24th February with all this, sketching all the scenery, listening to my travel theme with that headphone (definitely popping to my mind is Riviera Life by Caro Emerald), and proudly grinning from ear to ear since i have an healthy smile with that travel toothbrush kit. This would be great when traveling to China and Korea at the first of the year. My current pack is about to give out and the Qwstion pack looks great. The headphones for the 14 hour flight would also be AWESOME! Would be PERFECT for my upcoming honeymoon in Thailand!!! Oh oh, I would take this pack to Istanbul to visit my close friend who moved there over a year ago (and I have not visited her yet!). I’m traveling to England, Scotland, and France in May and this would be the perfect thing to take with me! I’ll be headed off to camp out in the Aussie bush! id take a solo trip on a disney cruise to relive my youth. Easy answer? Everywhere. As non-revenue travelers my husband and I can (and do) throw darts at a map to pic a vacation destination. This pack could take us back to the slums in Bucaramanga, Hill Country in Texas, or the Peninsula in Hong Kong…. Or it could just take us on a road trip to Tennessee and Michigan for the holidays! Oregon in winter, no question. I would love to backpack throughout most of Europe. However I have no plans for doing that. Returning to Maine for more awesome hiking would be good too though! I will take this with me to the Netherlands! It will be nice and cool to bring it around Amsterdam! I would definitely take this with me on a trip to do wildlife conservation volunteer work in Costa Rica. It’s something I’ve already planned and this would be such an extra bonus. I NEEEEEED THIS NOTCOT PACK! I am a student at the New School in NYC, and was one of the three people in my program that were selected to participate in the Democracy and Diversity Institute in Johannesburg, South Africa. I’m leaving on 12/27/12, and (aside from a few small scholarships) I’m basically spending ALL of my money to participate (seriously). I’m in dire need of luggage, a backpack, headphones, notebooks (I plan to interview people working in Social Good), and that travel toothbrush is awesome! Help a struggling college student working toward doing good in the world! I’m heading to NYC in a few months and this would be perfect. I would take this set up on my way to Yosemite! I would take off to Tangiers, sip some mint tea, take photos of tiles, attempt to write epic Arabic poetry, surf a little down the coast, and try to relive the inspiration of the beat artists of yesteryear. with all of this cool stuff. I’d go spend a couple of weeks biking through France or Ireland. I’d take off to california. Give me Costa Rica or give me death….No, wait, scratch that. Just give me Costa Rica. I would head on a 3 day trip to yellowstone. Always pining to be back in Berlin. I’m going on a photo trip to Iceland in March! How I’d love to bring this along to replace my old worn out things!! Definitely Portland, I always wanted to visit there. I would use the bundle for an excellent ski trip to Chile. Headed down to Peru, gonna bike the whole way back up. I would head back to the Amazon and hang out with all my Brazilian friends! Milford Sound & Stewart Island, in New Zealand. I’ll take it fjord hopping in Norway! This is such a sick gift package! I’d take it to China to visit my husband’s family. I’m studying abroad in Madrid this semester and would take it there as well as to all the surrounding areas I travel! I’ve never been out of the country before and could really use all of the above equipment. It’s always been a dream shared by my older sister and me to go back-packing in Yellowstone, so when I return, I’d also take it there! I’ve been aching to go to Reykjavik for a combo hiking / Blue Lagoon exploration trip… what a treat. I would pack up for a day trip and visit the turtle conservatory at Praia do Forte Beach in the state of Bahia, Brazil. I could also turn the Hideo Tarpaulin Luggage into a makeshift turtle pool. cross-country road trip with my bff! Memphis bbq, Grand Canyon, Painted Desert, Las Vegas, Yosemite, Reno…here we come! With the most awesome travel pack ever. I would take it and go on an adventure in the redwoods. wanna take it to NYC! I think the first place this pack would see is New Zealand! The Norwegian National Tourist Routes. I little nature and a little architecture. I would head from NY to Seattle to see my many cousins and all of their little ones. I would LOVE to go to Greece! my husbands grandmother is from Jerusaleum and he is the one member of his family that hasnt gotten to visit the area and learn about where he came from. I’d love for us both to go and do a lot of exploring! If I won the package I’d love to head to São Paulo, Brasil and DJ with some friends down there. Perfect for my trip to NZ early next year. Into the wild, of course. I would pack a bag and take off for the St. Martin’s Lane Hotel in London. I’d spend my time exploring the South Bank and browsing pop-up book sales along the river. …IVE BEEN PLANNING A DRIVE-SAFARI TO KENIA & TANZANIA.THIS WOULD BE PERFECT ~! With this bundle, I’ll take off on a solo trip to visit at least one country from 6 of the 7 continents in the world! (As I’m only 20 and it’s a bit too scary to go to Antarctica alone) So, I’d go to 1) New York, USA, in South America. 2) Rio De Janeiro, Brazil, in South America. 3) Paris, France, in Europe. 4) Marrakesh, Morocco in Africa. 5) Bali, Indonesia, in Asia. 6) Queenstown, New Zealand, in Oceania. Oh by the way, the Qwstion washed grey backpack looks uber chic and cool so even if I’m not on a trip overseas, I’d most probably end up using it everyday for college! backpacking through Scotland in June 2013 and would love to have travel gear that works whether I’m hiking through the highlands or trying to grab a pint in edinburgh. I’m currently living abroad in Scotland, so I’d love to take this set of gear with me on my many planned European excursions! First, to the French and Swiss alps! I would want to head to sapporo and have a beer. I would travel around Korea (where I am now), and then to China, where I’m headed in April, and then South America, hopefully. I would hitchhike my way around Australia! I would put everything in the Hideo tarp luggage and take it all for a stroll in the forests of Brazil! First thing - I would take this all on the winter trip to Niagara Falls I’m planning! Then off to Washington DC to visit my sister and who knows where after that. Awesome stuff. I would really love a trip to Machu Picchu. heading to Europe, and I could definitely use everything here! With this gear I’d be perfectly geared up for my middle east backpacking trip I’ve been planning for years! I’lll be ready for those probably harsh conditions in Dubai, Abu Dhabi, Alexandria, Cairo, Israel, Istanbul, and so many more places! I would take this with me on my trip to the UK & Europe I’m going on in a few months. I’ll be staying for 12 months and would love to take these goodies with me on my awesome adventure! To the hot springs of Japan. Perfect excuse to head to St. Lucia. I’d take a trip home to see my family in Ireland, and then straight back to south America where I’m currently having the best year of my life. the day after this arrives I’m off to thailand! I would take this awesome gear on a snowboarding trip to Chamonix France at the foot of Mount Blanc with my oldest buddy who I have been getting in trouble with for nearly thirty years now. This would be the perfect set to make him jealous with. My current bag died a tragic death when I was travelling the west coast of Australia, so I’m in desperate need of something to cart around all of the random things I have a habit of collecting. Next on the list is New Zealand and Asia & then back to England to make a plan for another epic adventure! My current dream destination is Morocco. I would climb the Atlas mountains and browse the souq at Marrakesh, and soak up the sun. Perfect for fast, international commuting. Warsaw - Köln sounds just right. I’ll leave on a jetplane, fly away to start off 2013 with a trip around Asia, living in style with durable luggage and super sound. I would go to Preikestolen, my next trip! I would straight away take off to Costa Rica. Pack that bag and board and get searching for waves. I have the biggest crush on this guy who’s already travelled Sri Lanka, India and Pakistan and is currently at the base of the Annapurna preparing to conquer it. Would love to win this all and (maybe only in my dreams) join him there and encourage him to succeed. With my bundle, I would start off with a trip to Manhattan. Then I would catch a flight to Munich to visit a friend of mine. From there i’d head to Manchester to visit another friend. Istanbul! I would head of to Istanbul with it. I mean, I’m heading there in february for a couple of month anyway. But you know it’s always good to travel with proper equipment to an amazing and crazy city like Istanbul! I’d leave out of the front door and just see where the road would take me. Cappadocia. There are so many stunning places in Turkey, but I think this particular one takes the cake. I would put this all to good use taking my camera and telescope equipment to northern Sweden for astrophotography, and if chance prevails, to see the Northern Lights! I’d would go back to Kenya, and continue doing mission trips for the less fortune children, and this wejetset would greatly help me as I travel. Leaving for India in Jan 2013 for couple months. Would take this lot with me. Thanks for the chance. All the way to Scotland where it’ll stay with me as I live and work in an ecovillage! I would go to Tokyo, Japan. Lost in translation all the way!! I think that looking at the products gives the best clue where i would take this pack. In North Musandum, Oman there are a series of large mountains that meet the sea. Many villagers have set up small towns, which have now become established communities, only accessible by boat!! I would take a canoe and travel from one to the other around the Khor Najd area, exploring inaccessible villages, rock caves and making my way along the coast to Ras Al Khaimah and Dubai! I’m leaving for New York city for my first time togheter with my wife. china! to visit my friends. I would take a nice long trip to go visit my Grandparents up in Kimberly, BC. (Canada!!) I would have to take two planes, and then a nice long drive! Yikes! I’m taking off for Copenhagen, Denmark for 7 month in the new year! Back packing/hunting trip in wild and wonderful West Virginia. I’d love to take a trip across the East coast! I would head to Maine! I’m going to London this summer, so this would be awesome. I’d be off to Myvatn, Iceland in a shot in February for the annual horse show on the frozen lake. It’s windy, cold and wet (my Wetjetset luggage would cope beautifully) but the company, both human and equine, would be amazing and I cannot imagine a better place to enjoy hot chocolate “adjusted” with Cointreau or warm up in a natural hotpot afterwards to restore circulation to fingers and tingling toes! I’d backpack across South Korea in autumn. Visit Jeju Island and hike the mountain trails! The notebooks would be perfect for keeping track of the things I see and do. After grad school, I plan to travel through Cambodia, Myanmar and I want to backpack around Ladakh, India! As a field experimentalist in the natural sciences, those field notebooks are too enticing to pass up! These prizes would look good on him—he’s fashionable, ever so! I would follow the f1 races for a year! Barcelona, I miss that beach. I would take it with my backpacking through Europe on my spring break while studying abroad. I would fly to Munich to Visit my wife. I would take off for Hawaii looking good. Back ome to my homeland Scotland and spend time with my family going on camping trips. I’ve been dying to explore The Netherlands, where my grandparents grew up. “take me to portland”, screamed the awesome package from wejetset. We live in Oregon. I’d take my husband, who is a woodworker, on a trip to see the Alvar Aalto library and collection at the Mount Angel Abby in St. Benedict, OR and the Frank Lloyd Wright house (Usonian) seven miles away. I’d take it to Mongolia. Im leaving for a semester abroad at the University of Salzburg, in Austria, this February. After that I am staying to travel on my own throughout Europe for another month. 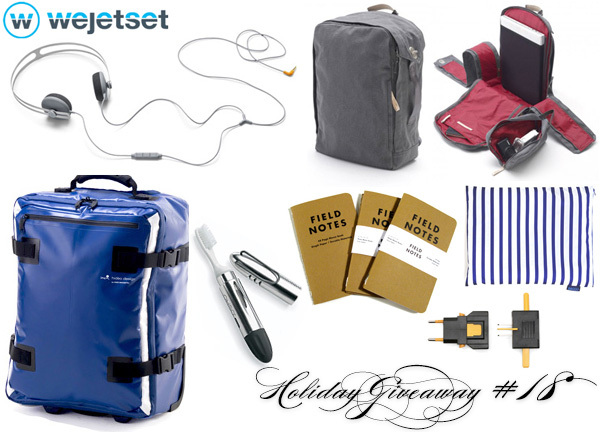 This giveaway would be awesome to take with me! I’ve been trying to convince a friend of mine with a sailboat in FL, to take a trip to the Dry Tortugas! Ugh, there are so many places I’d want to travel with these. But if I had to choose just one place to travel to, it would probably be around Southeast Asia - specifically Phuket, Thailand, for a month of relaxation and rejuvenation. I’d travel to wherever my yak took me. His fur smells of marzipan. I’d love to take it to Germany to visit my relatives. I would travel with that stuff to the Mentawai Islands. I’ve been waiting all my life for an adventure in Japan! this would be a great getaway gift, as my wife and i get ready to trek to Scandinavia and recreate the Viking trip across the Atlantic—on to Greenland, Iceland, and west to the New World. Norsemen we are not, but it’s always been a dream of ours. Help make it happen? I would so totally go to Sweden to pimp these sweet designs yo! I would take it with me to Germany this summer! I would take it with me on my trip to Mexico celebrating my graduation from college of on a long cycling trip this summer! After an intense spring semester, I’ll break away from reality; and appreciate some time on the olive groves in Greece, on the Island of Corfu. Then off to Oslo, Norway to visit my brother, (foreign exchange student we hosted in primary school.) We would go west and see some of his countries fjords, and I know I will be appalled by the sight. Just thinking about it gives me butterflies! I would give this set to my mister so he could take off and visit his mother for Christmas. This would be great for me to take to my trip around Indonesia. Especially to those remote islands I’m planning to go to. Being from Asia, it has always been on my bucket list to backpack all around Europe. I plan to strike at least 5 things off my bucket list in 2013, and a trip to Europe could be one of them! I would go hiking and white water rafting in the Swiss countryside! well okay, fine. osaka, japan it is. Travel to Fontainebleau to hang with the Bleausards and learn the secrets of the forest! Escalade à Fontainebleau!! I’d fly up to Vancouver and hop on Rail Canada, journeying across the entire length of the country to Halifax, stopping in big and small towns on the way and using the backpack for day trips. I’d head straight for Canada, I’d love to travel along the “the Canadian” from Vancouver to Toronto. I would take this with me to Bali for my friend’s wedding! It’s perfect for Köln, I would assume since I’ve never been. The bundle would be perfect for my trip to Kyoto, Japan! The newness and sleekness of everything in this great bundle would be a perfect contrast to Kyoto’s historic and classic beauty. Also, it’s the perfect size to fit in all my stuff for easy traveling! Asia - Most specifically Thailand, Vietnam & Cambodia. Banff. Alberta, Canada. Super dreamy snowy goodness. Most of the time when I travel, I would do multiple activities. I tend to hike, dive, visit the museums/art centers and etc. From the urban areas to the jungle and sometimes, the ocean. I bet that the wejetset is set for every terrain that i’ll be heading to. I bet the wejeset will be the best bundle EVER to head for Australia! the Field Notes would be an awesome addition for me to sketch the monuments and awesome views that i’ll be setting my eyes on! while the Hideo tarp luggage, will be a massive help to replace my backpack that tends to get wet whenever i head for a hiking near the rivers/dive trip.since it’s water resistant! SO, AUSTRALIA it is! i would visit Moscow and then i would take the Trans-Siberian Railway all the way down to Pyongyang or Vladivostok. Saving up for the journey of my dreams. I would immediately leave for New Zealand! As a student anthropologist, I would fill those field notes cover to cover with observations from Maldives! I’d probably go to Oregon and Washington during the spring. I’d go to Canada and Hawaii and just go and write about everything I’d see. This pack would be awesome for that! Just imagine all the little drawings I could make. Sapporo, Japan. It’s time to enjoy snow. I heading to Peru in march and would love to have this hiking. There’s flooding and devastation in my country; and then there’s Christmas. I’m torn between flying home to celebrate the season with my family and traveling further south of Manila to lend a helping hand. My cousin’s wedding in Franschheok! I’ll definitely use the Qwistion backpack and the rest of the portable items for the Camino de Santiago path through Spain. Had a couple of friends do it and I figure it’ll be just as fun to do something similar. I would take it to Nepal! I’d go around the Philippines! I’d start from the north like Laoag, Vigan, San Fernando, La Union, then make my way slowly to the south to Camarines Sur, and go to the other big islands like Bohol, Boracay and end it all in Surigao for an awesome surfing adventure. It would be the ultimate adventure via land, sea and air! I have dreamed of traveling the world as far back as I can remember. It is still my ultimate goal in life to walk across as many continents, countries, and cultures as possible. I don’t have a specific destination figured out for this travel pack but it would only enable me to begin my dream sooner. I am moving to a different state in a matter of a few months, and I am so excited to move out of my home-state because it feels like it’s the first step on my journey. I think that I might use the travel pack to move to that state a month ahead of my family and get situated. I imagine traveling the world with the barest of necessities I need to record my experiences and to survive. The fact that this comes with field journals, a means to carry a laptop, a universal plug adapter, and the toothbrush kit essentially secures even luxuries that I haven’t even considered. The universal plug would be a great use in a variety of situations as I go to across seas. The fact that the travel bag is water resistant makes my heart flutter because I am a klutz and spill things, also it would protect my belongings such as family photographs wedged between clothes. The hideo also rolls and has a handle, which would reduce the strain of carrying baggage. Rolling bags are just generally advantageous in a variety of situations. So I can’t say where I’m going to take it, because if this travel pack really suits my traveling needs, then it just might go EVERYWHERE until inevitably destroyed. Thank you for considering my contribution. I would definitely take this on a full tour of Japan! I would like to take a trip up the coast from Los Angeles to San Francisco. I’m going to Pakistan and Dubai this month so I would definitely use it then ! I have taken this year off from college and I am leaving after the New Year to explore Europe alone. My father passed away last November, and I am taking this journey in dedication to him. He worked hard to become a history teacher, but never got the chance to see many of the places that he taught about. At nineteen, I am nervous, but so excited to see the UK, the Netherlands, and France, to explore the locations that hold so many stories that my father loved. This pack would be a great addition to my very first solo travel experience. Thank you! I would finally be prepared to wander wherever I pleased with this set. India, Thailand, Morocco…I’d go wherever the next beautiful dream led me. We’d go to Harbert, Michigan, and stay at the beach all weekend long. This time of year…definitely Fiji! With a kit like this why would I have to choose just one spot? My mind roams over the rolling hills of Ireland, into the deepest seas in Australia (The Great Barrier Reef that is), and moves into the labyrinth of trees that is the Amazon. I’ve never been to Brasil, I think I would start there. But I could never forget sweet and passionate Italy or powerful and frigid Russia or even the soothing call of a Caribbean island; something where I can do good by the ocean, Haiti or Cuba or the Dominican Republic. I would love to trip over my own feet learning the Flamenco in Portugal or swim myself silly trying to surf in Hawaii. I won’t choose just one spot to explore when South Africa and Egypt, Greece and Spain, Japan and Mongolia, Chile and Peru, Canada and Mexico and the whole rest of the world awaits me and my cool travel pack! Vancouver Island to visit one my favourite cities, Victoria! I would go to B.C. and ride trails all day. This stuff would be super handy! I’d come back home to the USA. This pack would be a perfect companion for my first trip to Seoul! I would go to Budapest, Hungary where I’m planning to study abroad next semester and then I would travel throughout Europe (i.e. Austria, Amsterdam, Paris, etc.) to visit my friends who are also studying abroad! Never been to Tokyo, seems like a good first step. I am an artist with wanderlust, so naturally I want to go everywhere. I’m currently planning trips to Colorado and California this summer- my twin lives in Cali and my best friend goes to school in CO. Next fall brings opportunities to go to France, Italy, Spain, the works! Spain, Portual and Morocco are at the top of my list! Well, if I owned this travel pack, I’d take it wherever I should wander. The first place I’d go, given the opportunity, is throughout Europe. I’d go backpacking throughout the continent and take this lovely stuff with me. Document everything in Field Notes journals—they’re just my style. Formentera Spain. Just the right size for a towel, sunglasses and a TON of sunscreen. Perfect for my upcoming trip to BVI. Tortola ahoy! Appalachian Trail, here I come! Portugal, down ol’ South America way. I would study abroad in Ghana. And then I’d use it when I am (hopefully) a part of the Peace Corps or Doctors Without Borders. I have friends living in Germany and Czech Republic that I’d like to go visit. I’d take it to Scotland with me: that bag looks much better able to handle the weather. My friends said they came back with overweight luggage not just from the souvenirs but mostly from their damp clothes! I would take these items with me to travel through Europe. Are you kidding me?? MARS!!! Hellllooooo Curiosity!!! Straight to Singapore with this prize bag! Monsoon season is a commin’ and the best way to be prepared is with the waterproof gear and the maneuverability of a backpack. To the hawker stands! I would go to Italy with this stuff. More personally Rome. Christmas in Bremen, New Year in Paris, Exams in Thessaloniki!!!! I would love to go to Eastern Europe. Or Italy. Probably Italy. please!! !i’m italian but i had to move to deft to study, i think this luggage will help me in the move!!! I’m looking at heading off somewhere early next year with my roommates…we’re thinking Amsterdam! 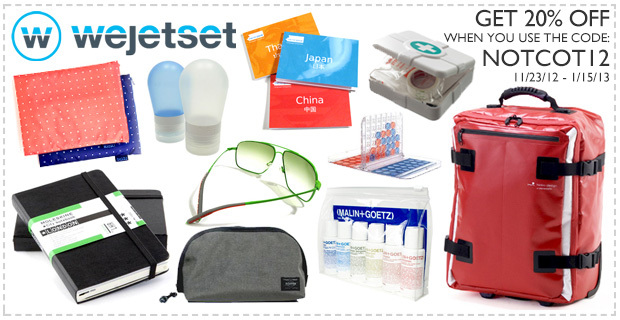 This is the first of many international destinations that these wejetset goodies would see, help me put them to good use! I would take all of this to Luang Prabang, Manila, Singapore, and back to Kunming! A South East Asia adventure made better by stylish luggage. I’d head to the airport and get the first possible flight. We’ll see where it takes me. I am going to Hawaii this holiday, so that sounds perfect! I’d be off to Brazil in a heartbeat. I’m heading on a rafting trip to Jackson Hole, Wyoming, this spring, and I’m missing all of these important essentials! I would go immediately for a bed-and-breakfast tour of Italy. That sounds perfect right about now. I’d fly to Europe with my wife. It’s a dream we have to go visit over there. My wife and I could make great use of this awesome travel gear on our trip to Prince Edward Island and Newfoundland this upcoming Spring. Field notes would be chalked full of whale and glacier sightings, Qwstion grey backpack could be stuffed full of food from the markets while we bike back to base camp and the Aiaiai headphones would be perfect for our silent rave at the historic Green Gables. I’d take all of this on my study abroad trip to Rome next semester! Oh goodness, the lot of this is perfect for a roadtrip! With this stuff, I’d be taking a road trip with some great friends, maybe even stop to camp and watch the stars. We’d travel from the Flagstaff forests to wild Las Vegas and down to a Californian beach. I would love to take a trip to England and see the very sites where great authors have lived or was inspired! I would take this abroad to Sweden where I am applying to study at Lund University on international exchange for a semester. I will be studying Geography and Anthropology and this would help so much because being a university student money is tight and loans have to be paid back. I just want to make the most of my trip and I think this would be a great addition! I would definitely put this gear to good use around the Ring of Keery. I would travel to upstate new york to visit my uncle so he could take me outdoor rock climbing for the first time in my life. We are close and have a good relationship but I hardly ever get to see him. I love to rock climb in my local gym but I want to go outdoors and he’s a seasoned pro. Just thinking about such a trip makes me want to cry. I would start my trip at the very bottom of Argentina, then work my way up through Patagonia and Chile, zig zag between those two countries, then move on to Peru to see Macchu Picchu, and Bolivia so see the famous salt flats! I’d love to go traveling in Europe! Id take this great stuff back home to visit my family! Cant travel without sweet gear! In this order: Athens (Greece), Seoul, Tokyo, Sydney, San Francisco, New York, Montréal, Saõ Paolo, Argentina. I would venture off to Jordan to see Petra with this lovely set! Everywhere I could before the world ends on Dec 21 hahaha! Would love to use this on my future trip to Japan, so my best friend and I can explore the whole country in one trip! The Galapagos Islands. No question. All of this gear would be perfect for my study abroad trip to Italy this January! To NYC/DC/ East Coast Grad school road trip tour! This West Coaster needs to spend some time on the other side. Iceland for Hanukah and Florida for Christmas! I’d head on a roadtrip with my sister — America’s a big country to explore! Antarctica, Patagonia, the Falkland Islands! I would not be as afraid of losing my roommate in Washington, DC, a super expensive town where most people live above their means. With this kit, I could couch-surf for a long time until I finished my graduate degree in the most expensive college in the country that doesn’t provide housing to grad students. I’d take the whole kit down to Honduras to my buddy’s brewery, celebrate a little, and then hop the pond over to Bosnia & Herzegovina to see *more* friends! Again, I’d love to go to Patagonia! I would love to jet off to Vietnam. I would thoroughly enjoy using this lovely equipment to go backpacking through vermont! I really need to escape my day job. im going to OFFF in barcelona this year! -and that right there would be perfect! First, Iceland to see their geothermal technologies, and to study their architecture. Then, Scotland to visit my ancestor’s island, and then on to Norway to study even more architecture! Finca Bellavista in Costa Rica. Treehouse hotel! With the solar explosions at their top, and the darkness prevailing in the north hemisphere, I will head straight up there, to take a look at the magic of the northern lights and to visit the beautiful -full of design- scandinavian countries. I would take it on a trip to visit all of my friends from the study abroad experience that I had this summer. This summer, I went to Korea to study abroad and I enjoyed my time there a LOT and made many friends there, as well. I miss many of my friends that I made there, but they live all over the world. They live in Europe, Australia, Singapore, Korea, Japan, Canada… I’d take it on a trip to visit them all as I miss them all so dearly. Far and wide in the Solomon Islands.. As the wet season approaches it would become a very dear friend, keeping my belongings dry as I cross the deep sea, hoping from island to island, as I hike through the rainforest of Guadalcanal and on my daily commute on foot and bus from Kola ridge to my work at No. 9 (hospital). A good friend just moved to Qatar, sounds exotic! Waterproofing & field notes? Time to head to the lesser unexplored parts of S.America - Guyana & Sruiname. Fly into Caracas, busses down the 10 to the border and then it’s boats, 4x4s and hiking in the middle of nowhere, bliss. I’d like to travel the world with my girlfriend, and getting this would help me be able to do that. It’d mean a lot to both of us, for us to get to be able to do that. We both grew up pretty poor and getting to do something for us for once would be great. We’ve talked about how much we’d like to go to Europe, the Near East and the Far East. South America and Australia to a lesser extent as well. Go places we’ve never been before, talk to people we’ve never met before, grow as people. I think we’d probably go to Denmark first. I went there when I was a child with my mother, and her family originally came from there. I’d take this pack to go to Thailand to visit family, then visit Vietnam and Cambodia. And after that, perhaps visit India; Rajastan, perhaps. I would take it to trip through Europe which i plan doing on my Honda Super Cub 50. I’d take the chance to finally visit Philly. Have to take someone up on an offer. New Zealand. I have never been out of the states and am longing to go to New Zealand. I’d skip right over to the Caribbean to escape the winter after the holidays! If I wont this awesome travel pack, it would inspire me to take head on the trans continental migration I have been dreaming of and plan for next year. I would be ready to trek across the country in style and prepared for anything. This awesome collection of travel accoutrements would join me in backpacking the Scottish highlands! Just mounted an Autohome tent to the roof of my car. Have always wanted to do the drive from Patagonia to the North Pole. I would take it do Stockholm for a design tour. I’ll need the fieldnotes for all the inspired sketching. I’d like to go to Croatia! Hokkaido. Antropological research and relax in the onsen. Plus lot of train riding. A friend is heading off next summer to hike up Mt Kilimanjaro and I’m really aching to join him. This would suit me nicely! i would probably head to a few places in eastern Europe(romania) where a few of my favorite photographers live so i could take their classes! Or I would head to New Zealand, aka Middle Earth! The other day I watched a video on a man who spent 23 years traveling around the world with the same truck. That is the kind of traveling I’d like to do. Just go everywhere! I just need to start with a kick in the right direction. I would take it with me to New Zealand in January - I’m off to see penguins, botanical gardens, Middle Earth, sheep, sheep and more sheep! I would take off to go visit a little city in Northern Thailand called Chiang Mai. It was also where I grew up. Vienna, Austria followed by Nanjing, China. I figure the two together back-to-back would make for an adventurous vacation. j’adore! i’d take this incredible package to cumberland island in georgia. the tarp luggage would be perfect for the boat ride there and camping on the beach, while the backpack and baggu would be ideal for short daytime adventures. i’d record all my wild horse sightings in the field notes. Galapagos island then to Quito, Ecuador. Turning 4O, an time hit the road in style. Puerto Rico or Lisbon? Where ever the tide rolls in. New York and/or Monterrey, likely quite a few trips to PDX. I’m booked to spend the summer doing research on language use in India. These bags would provide an excellent morale boost for the project. There are 2 places that I would love to travel to soon, Hawaii and Australia, so I would take this stuff there! I’d run to Italy on study abroad to study architecture. This pack is too perfect! I’d like to take this to San Fransisco, California for Christmas. This looks like the perfect kit for my honeymoon in Bora Bora! Oh man! I’d take that bundle all the way to London for my study abroad trip! And then I’d take it to Vienna so I could visit my friend Esther. Then to Santo Domingo to visit my friend Maria! I would head out into the wilderness or forests of Northern California and make some field recordings of the nature. Looks like if I camped I’d have a toothbrush for the morning, too! Bonus! Ideally, Thailand, for great food and learning how to surf. Realistically, Kauai so I can sleep on my cousin’s couch and still learn how to surf for a lot less cash. I would take it with me to HongKong. Ubud is definitely next on my list, and this set would be perfect! As it will coincide with some possible trips ahead, I would say I’d take off to Shanghai, and Singapore. But I do not see why this bundle should limit its usage to certain geographical locations, if it’s possible, I’d take it on whichever city, whichever continent I fly off to, basically every trip I’ll be on, I want to bring it on all journeys, no matter how big or small. Not only does the products in the bundle seem so practical but they look amazing as well, so much so I just want to use it whenever the occasion rises where I need a backpack or a headphone - just an excuse to lug my awesome gear in some awesome bags. I still would like to go to Iceland, hope will go with one of these übercool things. I would take this to Georgia to teach English next September. It would be perfect for traveling during my month long break. First stop: London. From there? Who knows! Anywhere but here, across the Universe, to infinity and beyond! I would take it all to Bariloche, South Argentina. I’ve always wanted to travel to Iceland, and this seems like the perfect set up to check it out with. The music, the hot springs, the growing tech culture, and the general not-quite-futureness of everything I see from that part of the world is just so compelling to me. I’d take off to Park City, Utah for some boarding and hanging with friends. Cabin in some very scenic mountains… what more can you ask for? In early 2013 I will be traveling to the Isiolo district of north eastern Kenya to help build latrines for school children. This is the first of several trips scheduled for the next year- our goal is to improve access to sanitation and hygiene to 100,000 kids next year. This WeJetSet package would be like a new best friend- keeping supplies for these kids, as well as my documentary gear, safe and dry. Sign me up! I would head to Thailand. Amazing people, food, scenery, and culture. Once I was there I would definitely take a cooking class - could keep my newfound recipes in the Field Notes! And, who doesn’t like a BAGGU? I mean, come on! Where couldn’t I go with this?! I’m headed on a school trip to West Texas in May and then June I’ll be doing my first European trip since I was 6. I think this would be PERFECT to roam around with as I explore Greece and Turkey! I am gonna win one of these one day!!! I’d head down to Patagonia. oh that’s easy … i would head back to Bogota, Colombia and continue to try every arepa i can get my hands on! I’d take off to Stockholm! would likely use it as a day bag. I would go to Morroco!! Since I was little I’ve been dying to go to Cuba. I have a tattoo dedicated to the country. I know I could go rogue, but I hope it is legal for Americans soon. Canada! More specifically: Yukon, Nunavut, NWT! I would probably head over to Korea! I would totally go exploring near seattle with this stuff. the forest like spots up there would be perfect!! I’ll tell ya where we’ll go. Someplace warm. A place where the beer flows like wine. Where beautiful women instinctively flock like the salmon of Capistrano. I’m talkin’ bout a little place called… As-pen. I’ve got a visit to San Francisco coming up. I haven’t been back in almost ten years, and I’m really looking forward to it—some great theater and choral performances, the DeYoung museum, reconnecting with my west coast family members… This setup would be perfect for the trip: stylish, rain-proof, and relaxed. Just right for the Bay. I would add a couple of shirts and my camera and head out to NYC on New Years! I would love to go visit my parents ancestral homeland of China and then backpack Southeast Asia! I’d take off to Nova Scotia! I will be off to Europe exploring the amazing histories and nature before global warming destroys them all! I would love to win this bundle! I love your guy’s stuff! I would love to go somewhere with a beach! St. Mauritius, Tahiti…. Please enter me for the drawing! I would definitely go to Florence. It’s my favorite city in the world. Gold Coast on a photo tour to kick off my new website, jet swell. I heart traveling. With 2012 coming to a close, we are planning our spring surf trip and debating about a driveable distance (Baja) with the dog or hoping a plane to a more remote, new (to us) surf adventure (Indo, Bali). Both are super appealing, both will involve some work and both will ensure sunshine and warmer water. The bundle for this week would be rad to have on either trip! Happy Holidays to you all! Mongolia, for sure. I’d go hunting with golden eagles. I would love to explore Norway, Finland and Sweden in the summer. They seem so friendly, and I would love to experience 20 hour days. Straight to Kostarika. It has been on my wishlist for years and I haven’t been outside Europe yet. Germany! And I’m not from Germany, so it’s not like I’d just be sitting around with it. I would pack a pair of comfy jeans and my favorite sweater, plus a little black dress - just in case - and head to Seattle, where I would haunt the waterfront piers, filling notebooks with sketches of passersby and ferries and the beautiful, beautiful sound. To New Zealand with my wife & son, and we leave in only a couple months! OH MAN! I’d hop on a non-stop flight to Amsterdam, then hop on a train to Norway, then a ferry to Sweden. I’d wander off to New Penzance Island because these goodies look like they’d be perfect for exploring a Wes Anderson movie. I’d pack this handsome set and jet off to Argentina for a loooong weekend. Hello Kyoto! Here I come! If I could get it in time, I would take the set with me for my current plans: Atlanta for an engagement party, New Mexico for a rocket launch, and Los Angeles for Christmas. It would be great to have a convenient travel kit! USVI. Cheers for the giveaway! I would use this bundle right away to help me get to Orlando to run my very first ever marathon, the Disney Marathon! I’ve always wanted to visit Ireland, England, scotland and the like. The history and sights are so amazing. I would take it all to Hawaii!